amazing as always! :) love the sunglasses! What a beautiful coat! I love the first picture! Me encanta como queda los cinturones. WOW, what a great idea!! !And the result is fabulous!!!! Love that wonderful black coat and the way you combined the 2 belts: perfection! The gloves and the bag in the same colour, give a perfect harmony to the outfit! I really admire you my lovely Veronica!!!!! Send you hugs dear Vanda! What an amazing and successful idea to combine two belts into an outfit!? The double belt looks is seriously gorgeous. nice outfit and very beautiful pictures !! I really love the idea!! great outfit! really like it! What a coat!!! JUST PERFECT! that’s a wonderful Idea love it soo chic!!! Absolutely stunning! I love the way you’ve combined those two belts! Who says that brown and black don’t match? ?Perfection!You look so sophisticated!Belt is sooo interesting! Amazing bag and belt,remember we have a lot. Kisses. Lovely, really cool, this coat is so elegant and chic! You look stunning! 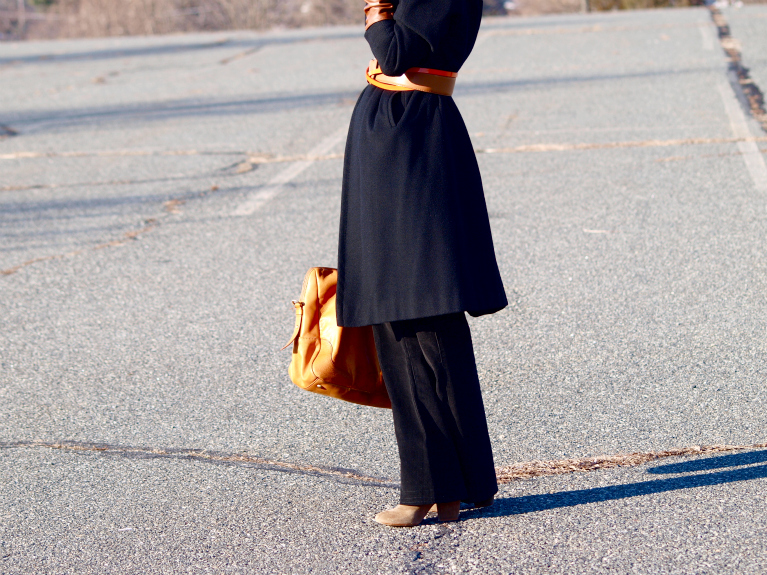 Love the way you mixed black classic coat with amazing caramel accessories! Especially love your long gloves! So very well put together! I love the belt. You are amazing. I’m following! This looks gorgeous, love the two belts! I love how you layered the two belts together. What a brilliant idea! You look gorgeous. You look amazing. The idea of two belts is genius! Such a classy look! These warm shades of brown, camel, caramel, look so elegant paired with black. You look so incredibly chic in this outfit. Love the belt and your bag. you are so pretty! love the idea to mix two belts! you look fabulous! the belts are so cool! this is another gorgeous outfit! Wow this combination of the belts is a brilliant idea, it looks so cool, a real eyecatcher! In general the brown accessories look so elegant with the all black outfit, especially this coat is so chic! thanks for your comment, love your blog, want to follow each other? Loved what you did with the belts!!! kisses from sunny & frozen Barcelona! I just found you and I really love your style!! Visit my blog sometime and tell me if you wanna follow each other!! I love the combo of belts you look so stylish and yo’uve got such a fashion sense ! Love the colors and the belts. Chic minimalism suits u great! I love that bag, I’m very fond of the color! Love this styling and the black and caramel colour tones of this outfit! I am a huge fan of styling cardigans/jumpers with skinny belts because they create a very feminine silhouette. Classy and chic! I love it! Veronica, você é tão elegante! Adoro teus looks, mas este em especial está muito bonito. Beijinhos. that belt is so special! gorgeous! You look stunning & chic as always. That belt is to die for. Beautiful !!! 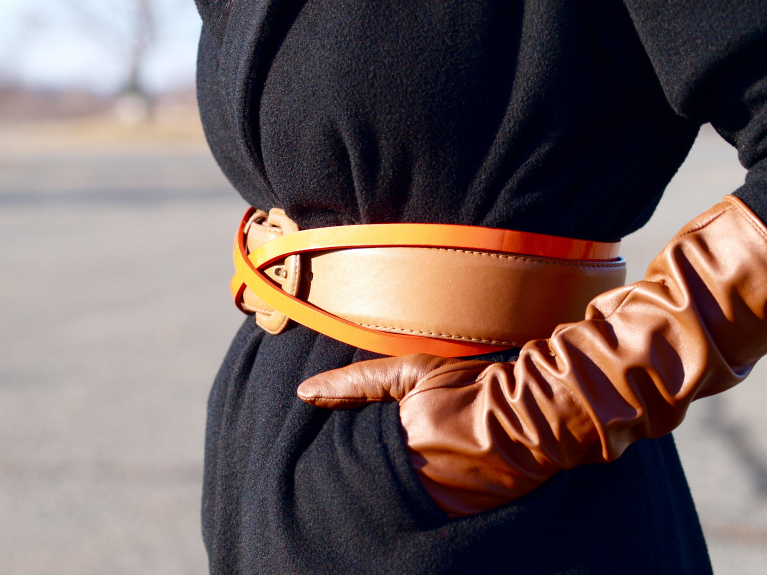 love your belt with the coat! Estás guapísima!!! me gusta mucho la combinación de colores que has utilizado. Veronica, it’s such a beautiful look. I like the simplicity of it underlined with chic yet not overwhelming details. And the idea with two belts! well, it’s brilliant! First I was staring at it and though where did she buy shuch a gorgeous, interesting piece! haha, I should have guessed that you came up with this idea yourself! Truly beautiful, intriguing accessory twist! I’m looking forward to see more of it! You always look so perfect! I love the way you kept the attention on the accessories! The long gloves are so beautiful! muchas gracias por pasarte y comentar!! me ha hecho mucha ilusión!! gorgeous!! amazing ideas… You are always so chic!! I am so far in love with this outfit. I love the accessories. Your sunglasses are hot, girl! your belt and sunnies are fantastic! the two belts together look amazing.Great idea! Great outfit, love the accessories!The coat is so nice too!! I love this post! Turning a focus on accessories is so refreshing, and I love how creative you got with it. Those layered belts in particular are amazing, and I love the contrast between the warm brown leather tones and the black. This belt combination is an amazing idea! Very nice and elegant leather gloves. Great. the 2 belt idea works so well, love how you mix colours, always so fab! Wow, super creative with the belt! Cool outfit! Gorgeous! Love the belt and bag. the belts are so cool. Oh,imi place enorm combinatia de curele,felul in care le-ai impletit,cu siguranta o sa incerc si eu!! Amazing post, amazing blog amazing YOU!!! Can you get any cuter!! Love this look! So chic. Love this look my dear!!! I love your gloves, belt and bag! Accessories matched perfectly! I love this look. It’s clssic, but so chic. I love these colors. Camel&black are always a good choice.